Wondering why you keep seeing Avenue Supermarket in the news every day? Here’s why. Mark the date- 21 March 2017. It will go down as a red-letter day in the history of markets. Why? On this day, the stock of Avenue Supermarket - promoter of retail supermarket chain D-Mart - listed at Rs. 604.4 on the Bombay Stock Exchange (BSE), witnessing a jump of 102% over its issue price of Rs. 299. This made the initial public offering (IPO) of Avenue Supermarket a stellar success. In fact, it is the biggest IPO success, since PNB Housing Finance made its debut in October last year. The Rs. 1,870-crore public issue of Avenue Supermarkets was open for subscription from 8 March 2017 to 10 March 2017. The price band on the offering was Rs. 295–299 per share. The issue received 1.38 lakh crore bids, meaning it was oversubscribed by 104.59 times. On listing, the stock generated huge returns. An investor who bid for a tranche of 50 shares of the issuance, would have paid about Rs. 14,950 at the lower end of the price band, i.e. Rs. 295 per share. With the listing price of Rs. 610, the value of his investments would have risen to Rs. 30,500, giving him a profit of Rs. 15,500. Some may wonder why there is such a fuss over Avenue Supermarket. If you’re wondering what an IPO is in the first place, here are the basics. A private company goes public through the process of an initial public offering (IPO). The company offers to sell its shares to market participants. Companies raise equity capital through a public offering of their newly created security. They make this offering in the primary market. The issuer (company) forms a legal document, called offer document, describing the IPO details. The offer document also warns investors about the investment risks. Based on the demand of investors, the company determines the price at which to offer the security. This is the book-building process. The company and its merchant bankers then arrive at a price band within which investors can make a bid. The lower end of the price band is the ‘floor’, and the higher end is the ‘cap’. The spread between the floor and the cap cannot be more than 20%. If demand for the new shares of the company exceeds the number of shares offered, the issue is considered ‘oversubscribed’. Once the subscription period ends, the shares offered in the IPO are ‘listed’ on the stock exchanges. The stock of the company is listed at a price that the market determines based on the company’s credentials. Why did Avenue Supermarket list at a premium? That the stock of Avenue Supermarkets listed at a premium comes as no surprise. It was a highly anticipated public offering from the start. After all, the founder of Avenue Supermarkets is serial investor Radhakrishna Damani. His is often considered the Warren Buffet of India, and is mentor to Rakesh Jhunjhunwala. But there is more. 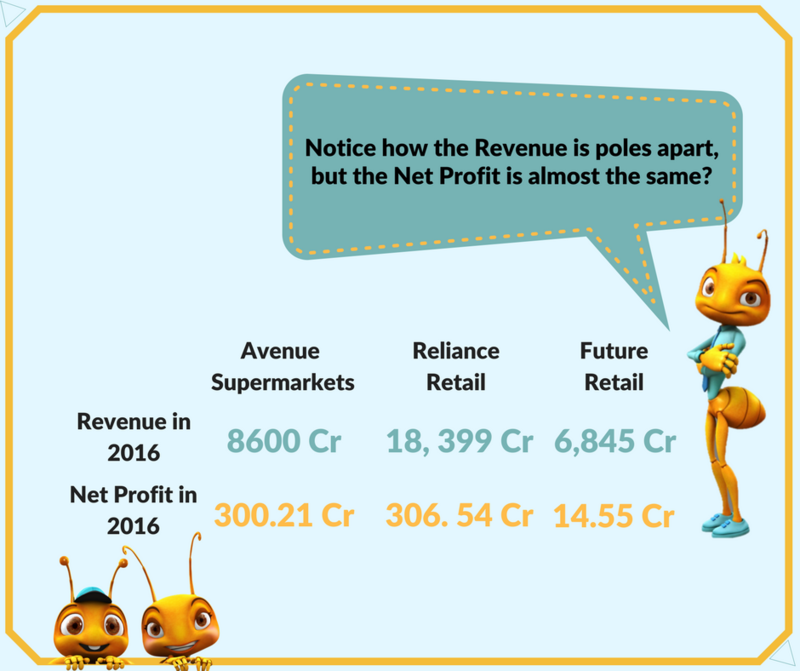 In the fiscal year 2016, Avenue Supermarkets made a net profit of Rs. 300.21 crore, on a revenue of Rs. 8,600 crore. Here’s how it compared to two other retail chains. D-Mart, the retail chain of Avenue Supermarkets, has scored with its buyers. It has focussed purely on value retailing in the food and grocery business. In contrast, its rivals have diversified into other segments. These include home, apparel, and electronic goods. The listing of Avenue Supermarket at a premium is recognition by the markets. It is indeed the most profitable supermarket in India, currently.